This week Stampendous is showing their new Spring Tweets Stamps and Dies. They're so sweet and cute. There's also a new stamp set of sayings, Tweet Chirps, that go with these perfectly. 1. The Spring Tweets stamps were stamped on watercolor paper with Onyx Black VersaFine ink and colored with watercolor pencils. 2. The images were diecut and set aside. Fitted Frames B and sponged with Shabby Shutters ink. 4. Glue die cut piece to a white panel and wrap with ribbon. Glue to a pink card. 5. Glue die cut images to card as shown, popping up birds with foam squares. 6. Stamp sentiment with black ink and add Pink Dot Sparklers around the sentiment. Head on over to the Stampendous Blog and see what the other Designers have made this week, the link is below. 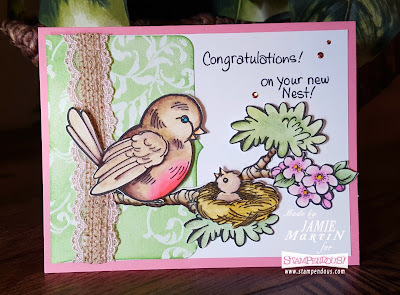 Love the soft and delicate colors on this delightful card! TFS! Your card is adorable. I love the birds!